Starting to do many things, I used to do again today. Changed up my workout, adding back in my afternoon workouts. I am also making sure I do my morning devotionals. 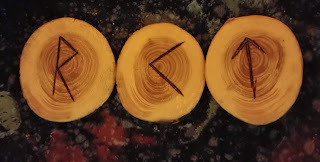 Part of that is drawing a rune each morning as a guide for the coming day. On Mondays, I will be doing a 3-rune draw to see what is to come in the upcoming week. Travel, knowledge and honor. I find these 3 very interesting as I begin a new path, well actually I begin walking an old path. Looking at these three I think that the gods and runes are all for me to make this journey work. The next 100 days should be very interesting. I hope I can accomplish everything I plan to do over the next 100 days.